What a nice place for dinner (or lunch, too, I would imagine). Good and interesting menu. Extremely thoughtful and excellent service (Jorge was out server). I had an excellent salad with avocado, mozzarella, and shrimp scampi and some very good tomato soup that tasted very fresh. My friend had spaghetti Bolognese which he thought tasted delicious though he wiched there were a little more meat in the sauce. But all in all, a very satisfying experience, and not overly crowded even on a Red Sox game night. My husband and I ordered the steak frites. We were served steak tips and steak frites. Their error was a delicious surprise. The steak tips were outstanding. The pomegranate sangria was exceptional!!!! We were happily surprised how good the food was, especially the Warm Calamari Salad and the Burrata appetizer. Looking forward to our next visit. Very below average food. Got upcharged $3 for a swap of different french fries that cost the same amount on the menu. Wouldn't go back! Despite our reservation, our party of 5 was seated at a table closest to the door with chilled breezes coming in everytime someone walked in. The service was poor, we had to remind him that we had no menus. The ambience was that of a campus restaurant. Sat at the bar. Good bar food. The food is sub par. I ordered the chicken marsala over parmesean risoto. It was NOT anything like I've ever tasted...total blah. Found out that the risoto is made with cream, rice and parmesean cheese. The food is basic and the prices reflect it. Waitress was super nice. Good food, excellent service, very good value. We enjoyed our dinner. The pizza was the best and Jen our service was great! Our wine glasses were dirty, the wait times were longer than expected for a place not super busy and our food sat out for a while so it was cold. The fries were undercooked and bland. But the menu selection was unique and the burratta appetizer was excellent. So let’s start with I made reservations for 6:30, arrived right on time and was told they had a “surprise” party of 10 so there would be a short wait. Ok I can handle that. Well a short wait turned into over 30 minutes with the hostess/waitress coming over to apologize and telling us our table would be ready in 3 minutes. Fast forward 15 more minutes and we are finally seated. We order as we’re sitting because I have an event scheduled in 30 minutes. Our food takes about 20 minutes to come out and is average at best. Very fishy haddock and a rather plain piece of steak. We wolfed our food down because we were in such a rush and then had to walk around the restaurant to find our waitress for the check because she didn’t check on us once since we got our food. I’m disappointed because their menu looked great but I honestly don’t think I would ever go back. Great food loved the steak tips. Service was great. Great waiting area if you are early. I had requested a double shot latte, which I have had elsewhere. It was rather weak. The parmesan cheese that was brought to the table was moldy, so it's unclear how fresh many other things might be. The women's restroom didn't have any soap or toilet paper in one stall. We were one of three tables in the restaurant, so the staff would have had time to check the status of the restrooms. The salmon was cooked well. The waitress was kind enough to not charge for my entree because of the moldy cheese. We made a reservation and were not informed they had a private event throughout the entire restaurant at the same time. Our table had a drunk guy sitting at the end of our booth holding a to go bag and a drunk woman screaming next to us. It was a mess... bags and trash everywhere. Waited 5min to be acknowledged by staff to check in for my reservation. Asked to be seated farthest from the door and was seated in an alcove directly by the door. Our server didn’t really check on us. Tasty menu, excellent service, and good proximity to Fenway Park and Copley Square. Service is always good, staff is friendly. Suggest reservations as it is in a prime location...Kenmore Square and BU crowd. Our waitress was outstanding. Everyone that worked there was so nice and welcoming. I got the haddock it was fine, but wish it had a bit more flavoring and more seasoning/breadcrumbs. The two appetizers we all split were yummy -- the spinach/artichoke dip and the arancini. I definitely plan to return. I wish we knew Thursday night was trivia night. Place is so small that hard to avoid the noise of the trivia game. The food was excellent!! However the service was slow and our table was not clean. The waitress apologized for the slow service saying "they didn't expect it to be so crowded". My friend and I thought that was odd since they are around the corner from Fenway and the Redsox were hosting the ALCS game. I would go there again because the food was great. Hopefully the manager will cross check Fenway parks schedule and staff accordingly going forward. Very tasty dinner ... lovely service & great locale! Pesto was amazing! Overall the food was great! The atmosphere was great. Very cute inside and definitely clean. Will absolutely return!!! Was grateful to find an open reservation in such a convenient location at last minute on a Saturday night. Should have tipped me off that this place was not in demand. Interesting menu but food mostly disappointing. Salmon and risotto both lacking in flavor. Gnocchi a weird, gummy texture. Best features were salads, the spring greens with figs, nuts and cheese, and a simple Caesar salad. Each of them was fresh and tasty. Waitress plesant but stretched too thin. Took quite a while to order. No one clearing the dirty tables around us. Not the experience I'd hoped for. Restaurant is a college hangout. We unfortunately were sitting next two college students who were extremely loud and used profanity continuously. Wait staff was very nice and attentive. Food was mediocre and we had to ask for bread which was cold. Great for kids but not for people forty and up. We had a delightful lunch with speedy attention and preparation of our dishes. Flatbreads were done just right. Food was good--not great. Large portions. Terrific service. This is essentially an affordable place for BU students and Red Sox fans coming from nearby Fenway. 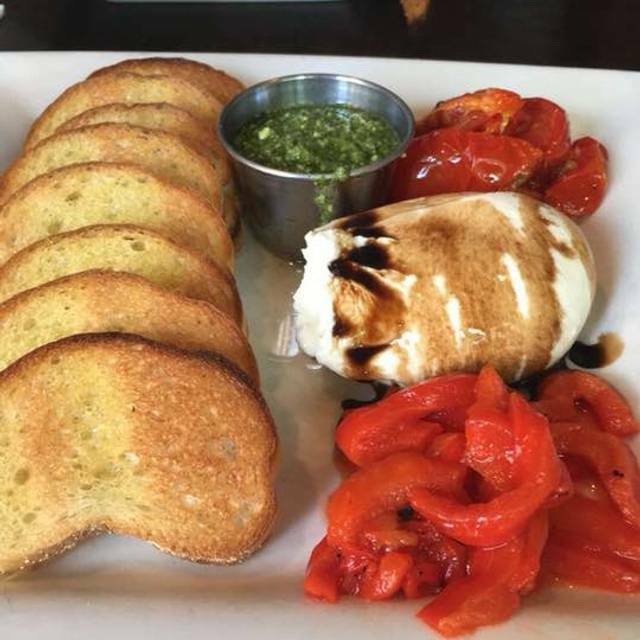 We started with the bruschetta appetizer, which was extremely fresh and very tasty. We both got the turkey tips, with rice and a side salad, all of which were very good. Our server Marine was very friendly, knowledgeable, and attentive. Overall a wonderful experience. Close to Fenway and not insanely busy, good food, nice atmosphere, CLEAN. Great experience all around, location, food, service, selection. For the win, Scoozi! We wanted a place to eat outdoors before the Pearl Jam concert. Shared a fig and prosciutto flatbread and a grain salad and the food was delicious. The server was very attentive and extremely pleasant. Outdoor tables weren’t fancy but it was a nice laid-back way to eat great food outside. And the beer list was good too! It’s impossible to get a table last minute before a Sox game in Kenmore. These guys had tables and the food came quickly but we were not rushed. Sangrias were amazing. Great spot!! Feel like I made a new pre-Red Sox game find! Food was terrific. Service was spotty but everyone was so so nice! I love this place and will definitely return!! First time there and it was very good. My partner and I had the pizza's (gluten free) and our friends had salads and burgers. I also had the hot mushroom and asparagus salad which was amazing. Nice place and not expensive. The service was very good. Hd an early dinner at Scoozi before heading to Fenway. We shared the arugula salad and for the entree we both had the salmon over risotto. Both dishes were delicious. Service was attentive. The only complaint- they didn’t have our open table reservation. It was a good thing they were not busy at that time. scoozi was great. the food was fabulous. the service not so much but it was really busy. we had to wait a long time for drinks and when we needed something it was hard to find the waitress. I would go there again. Recently went here with some friends before a concert at Fenway. The service was great. Our drinks were always full and the food came quickly. We tried the fried pickles, arincini, and calamari apps. All were delicious! I got the house burger and fries. It was tasty, but nothing too exciting. Overall we enjoyed our meal and would go back. We to Scoozi before a concert at Fenway, based on seeing some good reviews on OpenTable. It was an all around forgettable experience, and we wouldn’t go back. We sat outside, which should have been nice, but there were bees everywhere. We were able to stick it out outside, but a couple of other tables left, and a couple were using their menus to try and swat bees on the table. We would have been able to overlook the bees if the food was good, but it was all tasteless, at best. We started with the spinach and artichoke dip, which was average, but the best thing we had. I got the house burger, which was over cooked and not very flavorful, despite having pesto and prosciutto on it. My wife had the arancini balls, which were tasteless and served in a tomato sauce that was way too sweet. She paired it with a Caesar salad that had mushy croutons and no taste. All around, it was disappointing, and we won’t go back. Stopped here before a concert at Fenway. Long wait for service as it was clear they were busy and overwhelmed, but some servers were able to turn over their tables around us quickly while we were sitting and waiting and waiting and waiting. Main reason we chose was location and quite honestly that's the only thing I had going for it. The food was decent, the service was very slow, and we will not be returning again.